This temple is also referred to as the Dhenupurisvara or the Thiripureeswarar, being dedicated to the lord Shiva; locally called as Dhenupureeswarar. This reference of Lord Shiva, in the region is derived from a belief that a cow here was given moksha to. The Shiva Lingham here is said to be Swayambhu or Self Manifested. Another striking feature of this temple is the old, brilliantly picturesque architecture. Built when the Cholas were reigning, this temple dates back to mostly the 10th century as per some religious statistics. Visit on a Sunday evening by 4:30pm to experience the popular Sarabeswarar Rahu kala puja. How popular is Dhenupureeswarar Temple? 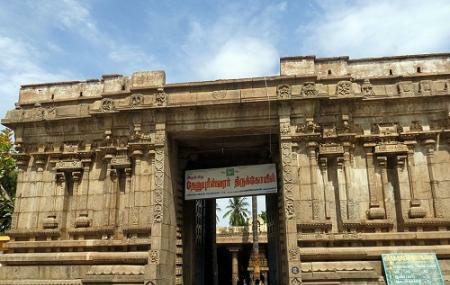 People normally also visit Kundrathur Murugan Temple while planning their trip to Dhenupureeswarar Temple. It's a very beautiful and calm space where you will feel calmness and full positive vibes. This place is very close to my heart.. Temple maintenance will be very great and a must go place for Chennai people..